This October I had the pleasure of going on what I have dubbed the "Epic Fall is Magic Mini Road Trip" with my mom. Originally my mom was just going to come to town for Rhinebeck but as the summer progressed the trip planning got more complex. I have this romantic idea of living in a small town on the coast of Maine. I'm fairly certain the movie Andre is to blame and I am not embarrassed to admit it (Tina Majorino FTW). So when my mom asked if I would like to add Maine to the travel itinerary I was pretty much elated. We only had about 2 days to explore and experience the Rockland area. 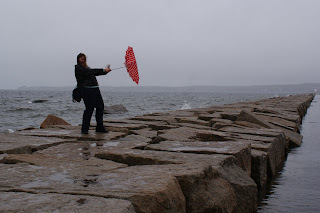 Originally we were going to take a ferry out to the island of Vinalhaven but the weather meant a very choppy ride which I didn't think my stomach could handle for an hour and a half each way so we ended up exploring the mainland instead. We had a really good lunch at the Home Kitchen Cafe, stopped at a couple cute quilting shops, found the Rock City Coffee Roasters located right on the coast (it smelled spectacular and looked out over a ton of boats), met up with extended family for a chicken pot pie dinner, and attempted to walk a bit on the Rockland Breakwater but as you can see we did not make it too terribly far, it was very cold and a bit slick. Overall Maine was exactly what I expected in many ways, the coast was gorgeous, the gloomy weather was perfect, the towns were cute, the air was nice and salty, and it would be entirely posible to get a mocha at an independent coffee shop on the water and take a walk along the coast. That last one in important since it is pretty much the top of my list of requirements for the place I want to live after NY. What I didn't expect was how much I would like the people. When they made small talk there was substance, it was fun small talk. Everyone seems to have their own weird quirky passion. I loved how many indy stores and restaurants there were. I am really terrified about someday leaving NY and being stuck with Chili's, Olive Garden, and McDonalds as my restaurant options, but it looked like I could avoid that entirely in Maine. Our visit was short and sweet, and was the perfect intro to a state I can definitely see myself living someday and hopefully visiting again soon.